Don’t let the Internet undermine Software as a Service (SaaS) deployments. With Silver Peak Unity, every SaaS application - including Microsoft Office 365 and Salesforce.com - becomes faster and more consistent over the Internet. Unity is the intelligent wide-area-network (WAN) fabric from Silver Peak that enables IT to control SaaS connectivity across the enterprise and accelerate SaaS applications over any network. Unity finds the best route to applications in the cloud, as well as on private networks. It does this using sophisticated cloud intelligence and WAN routing technology, which correlates information about SaaS applications and Internet “weather,” then sends traffic to the cloud over the shortest or least-congested path. With Silver Peak Unity, IT leaders can regain visibility and control over SaaS across the enterprise, while providing users with the performance consistency they need for SaaS. The Unity network fabric is generated by Silver Peak software installed in data centers, branch offices and cloud interconnection hubs. Silver Peak's Cloud Intelligence service aggregates ever-changing information about SaaS providers, including the physical locations where the providers’ data is being served, and provides minute-to-minute updates on Internet weather patterns. 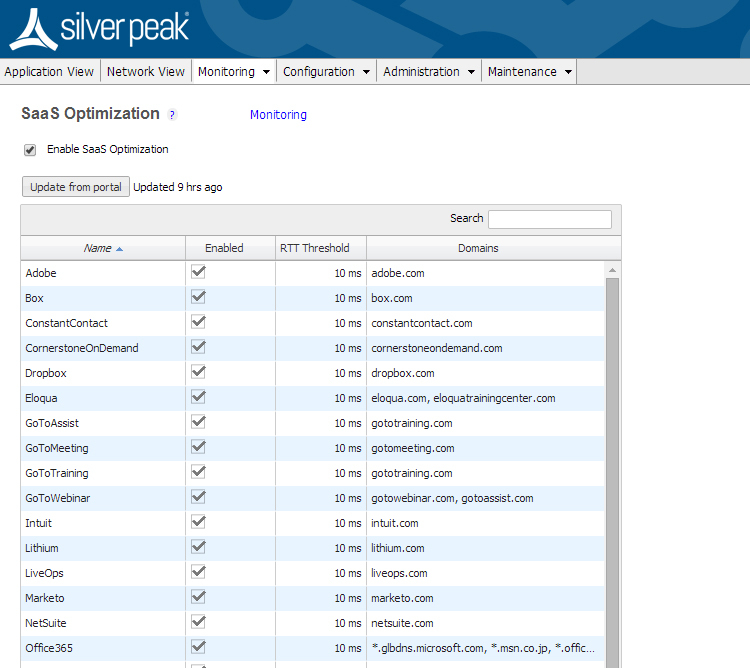 The Silver Peak instances use this data to measure the loss, latency and other metrics from their locations to different services in the cloud. This information is broadcasted to all other instances on the fabric, enabling Unity to calculate the optimal end-to-end path for any user on the network to any SaaS destination. 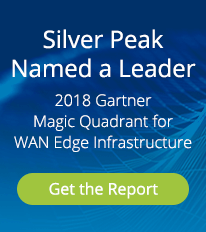 By enabling Silver Peak instances within cloud interconnection points, such as Equinix Enterprise Performance Hubs, or within IaaS providers such as Amazon Web Services (AWS) or VMware vCloud, enterprises can easily extend the monitoring, control, and optimization of their WAN all the way to the doorstep of SaaS. Silver Peak is constantly adding support for new SaaS services, along with new cloud hub and IaaS partnerships that help enterprises extend their Unity fabric. Silver Peak’s Cloud Intelligence is included with the EdgeConnect BASE software licenses and includes all supported SaaS applications. Optimizes every SaaS application, including Office 365 and Salesforce.com, and new applications are constantly being added. Advanced Exterior WAN Routing identifies the closest egress to SaaS data centers and directs traffic over an optimal path. Advanced Interior WAN Routing dynamically selects the fastest, least-congested, or most available path for traffic by monitoring packet loss, latency, and bandwidth in real-time. Cloud Intelligence subscription service delivers information about SaaS applications to Silver Peak software instances, creating an Internet weather map for intelligent routing decisions. Works across all networks, including MPLS, Internet VPNs or private lines. Unity finds the best path for any SaaS application. Optimize performance for all SaaS applications. Accelerate Office 365, Salesforce.com and any other SaaS application with one fee per enterprise. CIOs and IT management gain visibility and control over all SaaS applications across the enterprise. Enterprise users gain the consistent performance they need for SaaS, with quicker file transfers and fast screen refreshes. Align SaaS with IT priorities. This white paper examines the requirements for optimizing SaaS and how Silver Peak's Unity WAN fabric gives IT the visibility and control that has been missing while giving users the performance they need. IDC report looks at the role hybrid cloud networks will play in the success of evolving enterprise business models. As enterprises extend to the cloud, more attention must be paid to the underlying network. Latency and loss rates across the Internet are as erratic as the weather. To illustrate the unpredictability, Silver Peak engaged with two leading Internet authorities to track latency and loss statistics for two weeks across hundreds of routes. Respected industry analyst Jim Metzler examines how SaaS and IaaS are changing the dynamics of the wide area network (WAN).